Now available in popular Rogue design. Very comfortable and easy to install. Just make sure that if you have pro-taper bars, you will need to file/sand down the gripping knobbies on the left side of the handle bars. DON'T force it, ask me how I know. Relatively easy to install. Throttle cable were a bit tricky, but not too bad. I was looking for comfort to mate with my Twisted Engineering Flex Bars and this was the right choice. They seem a bit thicker for my large hands and helped a bit more with the constant hammering on my wrists and shoulders. As an aging rider I need every bit of comfort! I am a fan of these grips. I have bigger hands and this grip works great as the circumference is bigger than most grips. I like the soft compound personally. Odi grips are a snap to change! I wanted a softer compound to replace the stock hard grips on my KTM. While Odi lock-ons are more expensive than regular grips, they're a snap to change and you can do so w/out ruining the grip AND you get a new throttle tube each time. So... I like 'em! My brand-new stock grips now live on the shelf, acting as a backup. Can't comment too much on durability yet but I don't expect the soft compound to last as long as the hard- that's to be expected. I have a tendon injury in my right arm and can not fully close my fist. These grips are perfect because they are fat enough for me to Braap around the track! Easy installation and definitely worth the money!!! Love these on my dual sport. Easy to install and very comfortable for long rides. Plenty of grip too. Good value. it comes with a throttle tube, so doesn't be stupid like me and buy a throttle tube. I really like the comfort these grips provide. The circumference is slightly larger than most grips which helps prevent cramping. They are soft and grippy which is great for the technical trail riding I typically do. Great grips, I’m a believer! Easy Install. Just finished my first ride with these grips and they performed very well. Arm pump was much less than I had been having and my throttle hand didn’t go numb. I’m a believer! These are my new go-to grip. I love these grips! No more messing with glue and safety wire. These are secure and comfortable. Will definitely have these on all of my future bikes. I haven’t ridden yet with them but I bought these to help with a little vibration. I mounted with wrap around hand guard and the ends punched out which is a nice feature. The stock KTM grips are quite thin and not very tacky. This was causing some numbness and tingling after a couple of hours of singletrack riding. Installation of these grips was easy and I reused my stock throttle cam. Action of the throttle side is smooth. I just spent three days riding in Moab with these grips. Not once did I feel hand numbness or tingling. These grips are thicker, softer, and quite tacky. This allowed me to relax my grip a bit and avoid the numbness issue. I would absolutely buy these again. These are the best grips I've tried so far. Protaper pillowtop used to be my go to grip. Not anymore! Love the feel of this grip in either the lock on or glue on versions. Absolutely love them...the best grips ever. Best grips on the market. Comfortable & durable. I have big, bony hands and the 1/2 waffle grips that came stock on my YZ250f were killing my hands. A friend recommended these mostly because I like fat grips. They've been great. The throttle side takes a few minutes to install, but the clutch side takes less than a minute and they haven't budged since installing. These aren't quite as soft as the ProTaper pillow tops on my other bike, but the ODIs are more durable so far and seem like they'll be more grippy in the wet, if it ever rains again. I'll never buy traditional grips again! Enough said. Buy theses now!! You wont regret it. Great for long rides. Helps on vibrations. All around plush grips. These are awesome grips! There a little thicker than normal grips. Which brings much more comfort and less vibrations into your hands. I absolutely LOVE them! There top notch! I would highly recommend them! This is a good product that finally made its way from mtn bikes to dirt bikes. They do take up a little more realistate on your bars that the typical glue on type grips but is much nicer when its time for a grip change. This version has more cushion than the Emig branded ones so this helps reduce vibrations to your hands. I have a typical size hand and for ride hours at a time on my 2-stroke. Most clamp on left grips are too thin for me due to the rigid mounting tube using up much of the available thickness leaving not much rubber for the soft part of the grip. These Rouges are not as soft as a true pillow top grip, but come pretty close and their diameter is just a minuscule bit bigger than a standard clamp-on grip (3mm of circumference = less than 1mm of diameter bigger). Of all the clamp on grips, this is the softest. Used this specific pattern on Trans America Trail trip. 6500 miles and still plenty of life left. I always tell people, I will never go back to traditional glue on grips. These are easy to install and never slip. Buy these and never look back. I use these on all of my bikes. Great wear and very easy to install. Reduces vibration and feels great for me. A little bit thicker than other grips. These are outstanding grips if you ride the nasty snot. Big chunky grips that offer a reasonable amount of dampening. The lock on feature is too trick, no more dealing with messy expensive grip glue. These are some plush grips. Soaks up quite a bit of vibration and are extremely comfortable. These are made from a softer compound so they do tear easier than a standard grip, if you aren't using a full wrap around handgaurd be prepared for the ends to tear if you drop the bike. The level of comfort is completely awesome. Love them, easy install fits great with hand-guards, comfortable, no slip!!! Wicked easy install, grip for days! Will never install any other type of grip - lock on is the way to go for simplicity of install. Love the type of grip on these Rogues - soft on your hands but all the grip you need. Will see how they wear given that they are soft but I've put 10 hours on them and see no visible wear yet so expect them to last a reasonable amount of time. Excellent fit and finish. Only thing is these don’t come with the throttle cam for an FE 501 so if your stock one is damaged might wanna look at something different. The larger diameter grip helps with not getting arm pump. Really easy to install. These grips provide plenty of cushion for the Pushin’. Locks work perfectly too. They are a bit thicker than your average grip though. Love these grips. Very comfortable, especially on long days of riding. They are very durable as well. Maybe they could be better but they work for me. I'm a woods rider rather than an, on the pipe performance, so i spend hours with my hands clutched on the trails and they provide good cushion. Went to these after years of using the Pro-Taper Pillowtops. These are great grips if you like a soft rubber between your hand and the bars. A little thicker in diameter too which is nice if you have bigger hands. If you like the Pillowtops, you'll love these. These last longer too. And, the ODI lock-on system is a million times better than messing with glue and safety wire. Bed grips out there. Have a few spare sets to take to the track since they take about 5 min to replace! Changed out stock 650 KLR grips with these. Have used them for a year now with 1500 miles offroad. Super comfortable, good grip and easy to install. They stay put. No wear or twisting. I like them. Will they work on motion pro universal throttlr ?? 1975 yamaha vintage ?? Can i run these grips on a kx 100 2009? No, unfortunately your machine is not listed in the drop boxes above the product image to fit. I'm sorry for the inconvenience. Will the cam on this grip work on a 2017 KTM 350 sxf? BEST ANSWER: The 2017 KTM 4-Stroke Cam is still in production, we recommend to use your OEM Snap on Cam that came included with this application from the factory. Just snap off your existing cam and install on our V2 Lock on system. Is this now shipping with a cam for my 17 FE501? 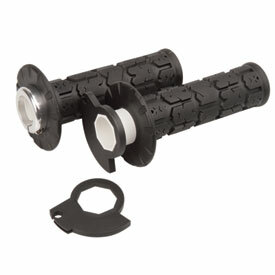 How do you knockout the ends to accomodate handguards using the Tusk grip end cutter? BEST ANSWER: It is very easy with this Tusk tool. You just insert the tool inside the grip and tap, this will pop out the end of the grip in a perfect circle. The look is much cleaner than cutting the end of the grip with a razor. Keep in mind this is to cut the grip end, not the handle bars. Not sure if this works with the ODI grips but I have used it with Pro Taper Pillow Tops and worked perfect. You select the right cutter, 7/8" for the clutch side, 1" for the throttle side, install the cutter onto the extension, slide it down into the grip, rest the end of the grip on a piece of 2x4, and nail it with a hammer once or twice. Done, a perfect round hole. No jagged mess, perfect. Step drill bit/unibit. I have them already. Wouldn't buy a special tool for a easy task with what's on hand. Maybe if I was doing it all day, or maybe once a week. But not something I do every few months. Don't over think it people. I had to do very minimal trimming. Make sure you use them on a hard surface so you get a clean cut. Install your new grips onto the bars and the use the tusk grip end cutter to cut the out, it come with two sizes depending on the bar. Makes a nice round cut then in stall your hand guards. I would just knock them out with a screwdriver. Very easy to do. There is a video on the product page. I think you should be able to, yes. Can you pop out the ends without a tool for your hand guards? BEST ANSWER: Ive only used these with cycra wrap around hand guards. I've had to cut the ends off with a hacksaw or drill them out then file to make the holes nice. No, they do not pop out so you will need to cut or trim them. I believe you have to customize it. But they will work. 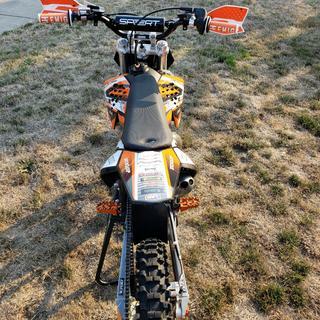 BEST ANSWER: Note that there are two versions of this grip for dirt bikes - a 4 stroke version: and a 2 stroke version: They each come with different "CAMS" to match those model types. In the case of the 4 stroke grip set "H34RGB" that the following CAMs are included: 4-Stroke Kit - Includes Cam: A, B & J. CAM I is needed for a DRZ 400. Other CAMS for 4 strokes smaller than 250cc per the ODI website. Bar diameter is universal. These work great on the DRZ I purchased them for. I have also used these grips on my ATVs for about 15 yrs now. Great product. They fit all bars, any bend and any brand. They are a little thicker than most grips. They are great for people with bigger hands. The ODI lock on grips will fit 1-1/8" and 7/8" handlebars. All bars are 7/8" at the grip area except for micro bars. BEST ANSWER: I am inclined to say “No”. You might be able to get the clutch side clamp over a heater element, but it would be difficult. The throttle side grip is permanently fused to the new tube, so there is no chance you could use a heater element on that side. I'm saying they will not. The grip is bonded to the tube, so no way to place it between the tube and grip. The grip tube on the clutch side is real snug going on the bar, I do not believe there is any room for the grip heater to fit. No. You would have to destructively remove the grip. Apply the heaters and then add a new grip over it. Ive seen people do it.. I wouldn’t recommend it. Id say get a metal throttle tube and go that route. I would say no. The rubber grip is bonded to a plastic tube and to the throttle tube. This is where the grip heater would need to be installed. Do these happen to fit motion pro turbo twist throttle? Will this fit my 2008 Crf230? Will these grips work with a G2 throttle tamer? BEST ANSWER: No. The throttle tube is built into the grip. You can however use the slow or fast cam that they provide to give you some customization. BEST ANSWER: I show that will not fit your machine. We are more than happy to help you find parts that will fit your machine by calling 800-336-5437. The part finder shows that the V2 Emig work on my 2015 beta 250rr and not the Rouge. But I want the V2 Rogue! Do they not have the Same cam options? BEST ANSWER: The Rogue style will work they share the same cam options you will be able to select the 2015 Beta 250RR. how thick is the rubber in diameter?